Thomas Meighan is buried at Saint Mary's Cemetery in his hometown of Pittsburgh, Pennsylvania. According to the website www.findagrave.com, he is buried in Section H, Lot 220. As he wished before he died almost a year ago, the body of Thomas Meighan, star of silent movies, has been laid to rest in his native Pittsburgh. Removed from a vault in New York City, the body was buried in the Meighan family plot in St. Mary's cemetery Saturday with simple services performed by the Reverend James Garahn of St. Paul's Cathedral. The Widow, Mrs. Frances Ring Meighan, three brothers and two sisters attended. 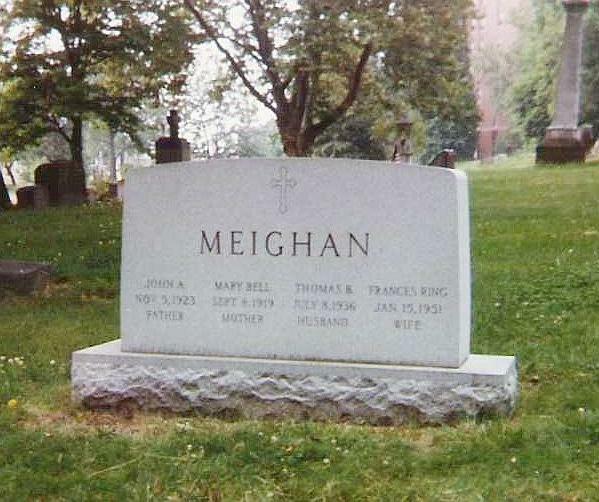 The photo shows that Thomas Meighan is buried with his parents, John A. and Mary (Bell) Meighan, and his wife, Frances Ring.